Well done also to our teams – with 2 Hitlists and 4 Tiplistings, we’re very proud of you all. My 16 year old is sitting his exams. All parents know the tension. If we’re honest we are more nervous for their results than we were for our own. Today (we keep getting told) is more competitive than ever before. I believe it. 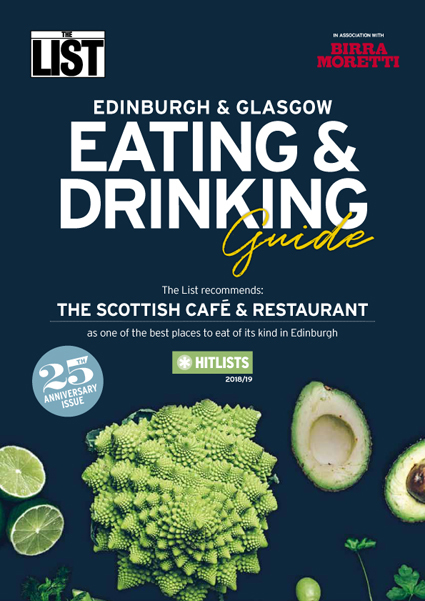 The annual Higher results for us restaurateurs were released last night via The List Eating & Drinking Guide for Edinburgh and Glasgow. Every year The List reviewers visit and review over 800 restaurants using a team of 65 reviewers. Now you don’t know when you’re sitting this test. It’s only after the paper has been set that the examiner lets you know. Blind testing, just like every other paying diner. Each List reviewer is like any other guest/customer. The team take The List review very seriously. It’s an impartial, independent critique of your product, your venue, your team. It’s honest and we greatly value it. There is always something to learn. It allows them all to get an opinion from a body they value, that’s not a TripAdvisor review or a who gets the most paid clicks on a competition. With so many new restaurants opening, almost daily, we value this anual reflection of our offer more than ever. Celebrating 25 years of The List we do value it’s independent contribution to an independent dining scene. Well done The List for delivering such a consistently high publication. My team have passed their exams, now onto the next ones, happening as we speak in a Contini venue near you.